Have you ever had one of those nights where you just didn't want to make what was on your meal plan? Better yet, have you ever had a night where you just didn't feel like cooking at all? OF COURSE YOU HAVE! I most certainly have. In fact, tonight was one such night, but we had to eat, so I scratched what I had on my menu and decided to just throw something together. You will never guess what happened. CULINARY MAGIC, THAT IS WHAT! By using some basic technique, and a mish-mash of ingredients, I came up with the most delicious OVEN FRIED RANCH PORK CHOPS! These may very well be the BEST pork chops I have had to date! You and your family are going to love them, and I can't wait to share with you how I did it! Next, add the ranch dressing. it around until all of your chops are well coated. Place in the fridge to marinate for 20 minutes. While the pork chops are marinating, Pre heat your oven to 450 degrees. As the oven is heating, place your baking dish in the oven to heat along with it. Now it is time to mix your breading. In a shallow dish combine the parmesan cheese and bread crumbs. After 20 min., remove the chops from the Ziploc bag and place in breading. Turn, and make sure they are thoroughly coated on all sides. Now remove the HOT dish from the oven and add the butter. Allow the butter to melt. Place the pork chops in the dish, and put them in the oven. After 10 minutes, remove from the oven and flip. Place back in the oven for 20 more minutes. Look at how stunning these Oven Fried Ranch Pork Chops look! I served these with my Roasted Carrots and Potatoes because I can cook them in the oven simultaneously! 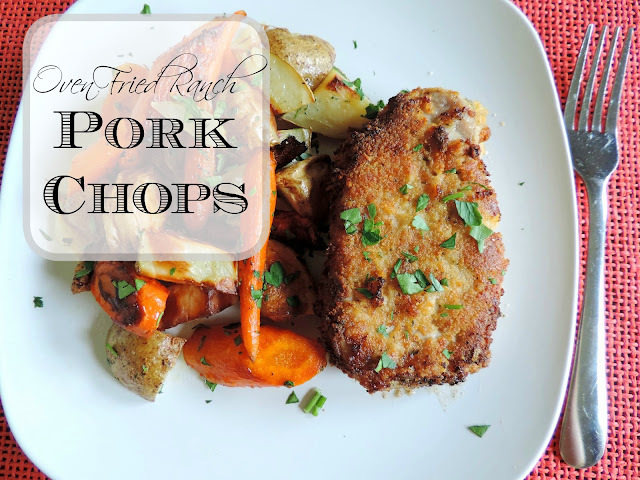 These Oven Fried Ranch Pork Chops are simple and use things you most likely have on hand. I know you are going to love them and your family will be singing your praises so get in the kitchen and give them a try TONIGHT! Place the pork chops in a Ziploc bag. Sprinkle with all purpose seasoning. Pour the ranch dressing over them. Press air out, close bag, and make sure all the chops liberally coated. Preheat the oven to 450 degrees WITH the baking dish in it. In a shallow pan, mix the bread crumbs and parmesan cheese together. After 20 minutes, remove the chops from the fridge and Ziploc bag, and place in the breading mixture. Remove hot dish from oven, and add butter. Place breaded pork chops in the hot baking dish. Remove dish from the oven, flip the chops, and return to the oven for another 20 minutes. LOVE the plastic bag method for coating! Such an easy trick for clean up! Thanks for sharing!